This article is about the 2020 series. For the 1974–75 season, see Doctor Who (season 12). The twelfth series of the British science fiction television programme Doctor Who is set to premiere in early 2020, with filming for the series having commenced in January 2019. The series will be the second to be led by Chris Chibnall as head writer and executive producer. This series will be the twelfth to air following the programme's revival in 2005, and will be the thirty-eighth season overall. Jodie Whittaker is due to return for her second series as the Thirteenth Doctor, the most recent incarnation of the Doctor, an alien Time Lord who travels through time and space in their TARDIS, which appears to be a British police box on the outside. 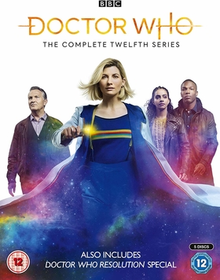 The series also stars Bradley Walsh, Tosin Cole and Mandip Gill as the Doctor's travelling companions, Graham O'Brien, Ryan Sinclair and Yasmin Khan, respectively. The series is the second series to feature Jodie Whittaker as the Thirteenth Doctor. Bradley Walsh, Tosin Cole, and Mandip Gill will also reprise their roles as Graham O'Brien, Ryan Sinclair and Yasmin Khan, respectively. Molly Harris is set to appear as a character named Suki Cheng. In April 2015, Steven Moffat confirmed that Doctor Who would run for at least another five years, extending the show until 2020. In May 2017, it was announced that due to the terms of a deal between BBC Worldwide and SMG Pictures in China, the company has first right of refusal on the purchase for the Chinese market of future series of the programme until and including Series 15. Chris Chibnall is set to return as the series' showrunner, the role he took on in January 2016 following Steven Moffat's departure after the tenth series. Ed Hime, who wrote the penultimate episode of the previous series, "It Takes You Away", is set to write an episode for the twelfth series, as well as Vinay Patel, who wrote "Demons of the Punjab" for the previous series. Victoria Asare-Archer and Prasanna Puwanarajah are set to be new writers for the twelfth series. Costume designer Ray Holman listed the twelfth series as being in pre-production in November 2018. By 17 November, BBC confirmed that Whittaker's second series had begun production. Jamie Stone, who previously directed the fiftieth anniversary minisode "The Last Day", directed the first block, which comprised the first and fifth episodes of the series. Filming commenced on 23 January 2019. Filming began in Cape Town, South Africa. Filming in South Africa ended on 7 February 2019 at Bowmans on Bree Street. Location filming also took place at Kogel Bay in Western Cape and Kersefontein Guest Farm in Hopefield. Filming took place in Cardiff between 10 and 11 February 2019, and at Guildhall in Swansea, Wales between 18 and 19 February 2019. Filming returned to Cardiff Central Police Station, which was set-dressed as Hallamshire Police in Sheffield on 11 March 2019. Filming has also taken place in Tenerife. The twelfth series was originally reported to be broadcast in late 2019 by Starburst; but the BBC confirmed after the eleventh series' finale that the series will premiere in "very early" 2020. ^ a b "Ratings Guide". Doctor Who News. Retrieved 5 December 2018. ^ a b c d e Laford, Andrea (20 March 2019). "Doctor Who Series 12: Block 1 actress discovered". Cultbox. Retrieved 22 March 2019. ^ a b Jeffrey, Morgan (31 December 2018). "Doctor Who series 12 will air on BBC One in "very early" 2020". DigitalSpy. Retrieved 31 December 2018. ^ a b c d e Royce, Jordan (17 November 2018). "DOCTOR WHO: BBC Confirm Series 12 to Broadcast in 2019". Starburst Magazine. Starburst Publishing Limited. Retrieved 17 November 2018. ^ Jeffrey, Morgan (7 December 2018). "Jodie Whittaker confirms she'll be back for Doctor Who series 12". DigitalSpy. Retrieved 7 December 2018. ^ a b "Doctor Who: Jodie Whittaker won't return for a new series until 2020". BBC. 9 December 2018. Retrieved 9 December 2018. ^ a b Fullerton, Huw (9 December 2018). "Doctor Who series 12 WILL be delayed to 2020". Radio Times. Retrieved 9 December 2018. ^ Fullerton, Huw (3 June 2017). "The BBC is already preparing for at least FIVE more series of Doctor Who". RadioTimes. Immediate Media Company. Retrieved 19 June 2017. ^ "Doctor Who Gets Brand Boost in China" (Press release). BBC. 25 May 2017. Retrieved 19 June 2017. ^ "Ed Hime". United Agents. Archived from the original on 10 December 2018. Retrieved 10 December 2018. ^ a b Laford, Andrea (1 February 2019). "Doctor Who Series 12: the writers". Cultbox. Retrieved 22 March 2019. ^ Bone, Christian (12 November 2018). "Doctor Who Season 12 Has Already Begun Pre-Production". WeGotThisCovered.com. Retrieved 17 November 2018. ^ "CV". Darryl Hammer. 9 August 2017. Retrieved 14 February 2019. ^ Harp, Justin (24 January 2019). "Doctor Who kicks off series 12 filming with first-look at Jodie Whittaker and cast". Digital Spy. Retrieved 24 January 2019. ^ 24 January 2019 (24 January 2019). "Doctor Who series 12 has officially started filming". RadioTimes. Retrieved 22 March 2019. ^ "Doctor Who Series 12: Jodie Whittaker and companion actors headed abroad". CultBox. 20 January 2019. Retrieved 22 March 2019. ^ "Doctor Who filming wraps in South Africa". CultBox. 7 February 2019. Retrieved 22 March 2019. ^ "Doctor Who filming in Cardiff". CultBox. 12 February 2019. Retrieved 22 March 2019. ^ "Doctor Who filming at Swansea Guildhall, Wales". CultBox. 19 February 2019. Retrieved 22 March 2019. ^ "Doctor Who Series 12: back to "Sheffield"". CultBox. 11 March 2019. Retrieved 22 March 2019. ^ "Doctor Who filming in Tenerife". CultBox. 6 April 2019. Retrieved 12 April 2019. This page was last edited on 16 April 2019, at 02:08 (UTC).